While the warmer weather is welcome after winter’s end, the insects of spring and summer are not. Yellow jackets are a type of predatory wasp feared for its painful sting. Need assistance ridding your property of these pests? Contact the Bug Dude for pest control in Fort Worth. While yellow jackets are primarily recognized as the common yellow and black Eastern yellow jacket, others may be black and white or red and white. Yellow jacket behavior includes the characteristic side to side flight prior to landing. Only females are capable of stinging, and while they are feared by almost everyone, they are predators of other insects known as pests. Yellow jackets build nests in trees, shrubs, or in protected places such as inside man-made structures, or in soil cavities, etc. Nests are constructed from wood fiber they chew into a paper-like pulp. A colony of yellow jackets may contain 1,000 or more workers by the fall, all of which are sterile females. Males appear in late summer, and once they become adults, they will mate with the females that will become the next year’s queens. The fertilized females will hibernate through the winter, while the workers and the males will perish when the weather turns cold. Receiving professional pest control in Fort Worth when nests are known can reduce the number of hibernating queens, and consequently the number of nests the following year. In the southeastern United States, where the southern yellow jacket (Vespula squamosa) resides, nests may persist through the winter, and colonies of this species may reach a population of 100,000 adults. A large number of yellow jackets are ground-nesters. Their colonies can be found under porches or steps, in sidewalk cracks, around railroad ties or at the base of trees. They will also build on the side of hills. Sometimes the queen will nest in a buildings wall void. Some yellow jackets build aerial nests in bushes, low-hanging branches or in the corners of buildings. Use caution when confronted with large numbers of the pest in specific areas, it is possible a nest is nearby. 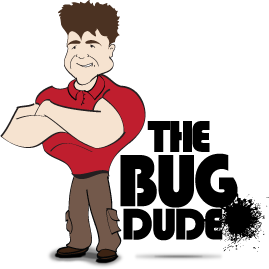 Contact The Bug Dude for pest control in Fort Worth if you suspect one or more nests. The sting of a yellow jacket is extremely painful, with victims often claiming the pain can last up to two weeks. Unfortunately, each insect is capable of delivering multiple stings. Yellow jacket stings may induce severe allergic reactions in some persons, and can be life threatening if a person is stung multiple times. Furthermore, yellow jacket stings typically result in swelling and redness. The eradication of yellow jacket nests is best left to professional pest control in Fort Worth. Yellow jackets are drawn to fast movement, particularly when agitated after a nest has been disturbed. Get away from the area as quickly as possible, but with the least amount of noise and commotion. Yellow jackets have been known to chase a person who disturbed their nest as far as 300 yards. If you are tired of yellow jackets around your home, contact The Bug Dude for professional pest control in Fort Worth to eradicate these stinging insects. If you suspect a yellow jacket nest located inside a wall of a building’s do not seal the entrance until all of the yellow jackets are dead. If the entrance is sealed, members of the colony will try to escape to the inside of the structure and thus create a stinging hazard to the occupants inside the building. Some of the preventive efforts that your pest management professional may recommend include keeping trash cans closed and clean so that yellow jackets are unable to feed on food residues either inside or outside the refuse container, and using specialized traps to capture yellow jackets that are attracted to the traps. Traps alone will not control them, however, the nests must be located and destroyed and a professional pest control in Fort Worth provide the safest means of doing so. Never crush a yellow jacket. A dying yellow jacket worker releases an alarm pheromone that alerts its nest mates. You could find yourself surrounded by angry members of its colony. Leave their eradication to The Bug Dude for pest control in Fort Worth. You can reduce their attraction to you by avoiding the use of hairspray, perfume, or aftershave and don’t wear bright-colored clothing, especially bright yellow, light blue, red, or orange. Wear white or light tan fabrics instead. Underground yellow jacket nests in East Texas have been known to be over 6 feet across and contained over 1 million cells. If chased by yellow jackets, run in a zigzag pattern, and seek shelter in a building or automobile. Do not jump in water, yellow jackets wait for you to surface. Yellow jackets require water for drinking and nest building. Reduce available water by repairing defective spigots and watering pets indoors. Keep fruit that drops from trees picked up and disposed of. Wear shoes when walking through lawns to avoid painful stings to bare feet. Be cautious when drinking from a can or bottle, as you may swallow a yellow jacket and receive a sting in the throat. Look before you drink. If you are bothered by yellow jackets, or other pests, contact The Bug Dude for professional pest control in Fort Worth. The Bug Dude serves Fort Worth and the surrounding areas.